'The Metaphysical Cyclist' is an art initiative which includes art-orientated bike rides around Cambridge this summer.This specially commissioned interactive artwork sees the fleet of Bikes du Bois Ronde get another outing. 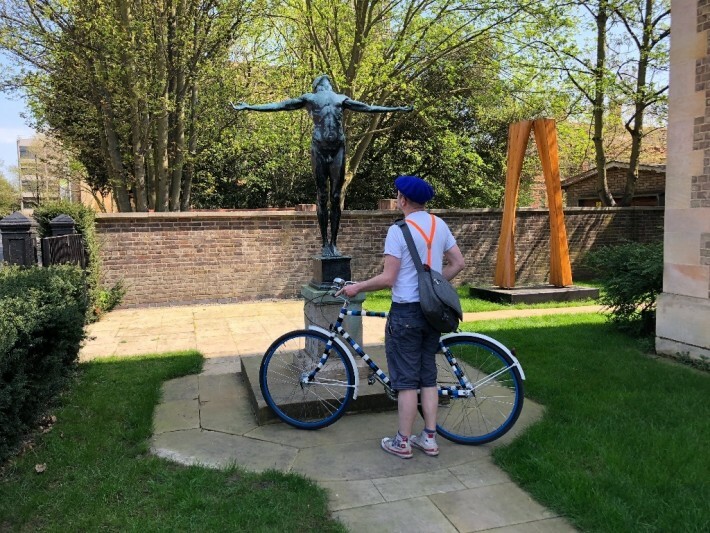 Concieved by internationally renowned British artist, Gavin Turk, the artist will take the public on a ride around his selection of Cambridge's outdoor sculptures on a fleet of colourful striped bikes. The artist collaborated with Cambridge based, Adam Dant, who has created an illustrated map of the route. Book tickets for the guided cycle tours lead by the artist here. To pick up a map and cycle on the tour by yourself contact the organiser here.